Would you believe the geometric iridescence on the left of this picture is something you can get from the dull grey hunk of metal on the right? It is — and we'll tell you how to do it. To make bismuth, grab a couple of disposable metal containers. You can use metal cups or saw the tops of two aluminum cans and use the bottoms. You will need to heat the metal to about 521 F to remove the impurities, which will form a skin on the top of the melted metal. Once the entire thing is melted, carefully use a utensil to pull back the skin and keep it in the original vessel while you pour the bismuth into the new clean cup. (You will want to heat the next vessel slightly so you don't cause the bismuth to cool too quickly.) Wait until you see a structure forming under the surface of the melted bismuth and the surface begins to solidify into a very loose jelly. Then quickly pour the jelly off into the old container. Why do you want to get rid of the jelly bit? Because you want to expose the crystals you're making to oxygen when they're good and hot. The iridescence you see is due to a layer of bismuth oxide. The oxide is different thicknesses in different places, but it's always so thin that light will bounce off the back and interfere with itself. Red light will cancel itself out in some places and intensify in others. The same goes for all other colors of light. The shifting interference patterns form the rainbow on the surface of the crystal. When the crystal cools down, you can snap off some and have it in your collection. 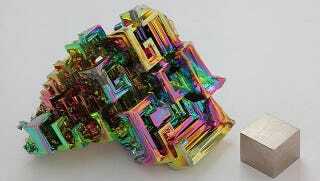 Technically, bismuth is radioactive, but it's so very stable in its radioactivity that it is not considered any danger. If 100 grams of bismuth 209 were created at the beginning of the universe, 99.9999999 grams would still be around. So enjoy your rainbow. Via Crystal Age, Chemicool, and About.com.